When I was young, I had a scrapbook, as many of us did, in which I used to paste pictures from magazines and calendars, stickers, birthday and Christmas cards, shiny chocolate wrappers, pieces of ribbon, bubble gum cards, and leaves and flowers from the garden. I once spent months buying bubble gum just to collect the Abba cards inside—even though I didn’t like bubble gum! I’m not sure what happened to that scrapbook. I never used to be sentimental about keeping things from my childhood. Now I wish that I had been. I would love to be able to look back on the things that meant something to me back then, to take a retro trip back to my seventies childhood. These days, scrapbooking has taken on a whole new life and is vastly different now to what it was back then. Billions are spent worldwide every year on embellishments, beautiful papers, and scrapbooking tools and products. But there was something special about those cheap scrapbooks we had as children, filled with bits and pieces that cost nothing (apart from the bubble gum cards), a time when we were happy with the simple things in life. I always feel sad when I see a vintage scrapbook for sale on trademe or eBay—sad that someone’s treasured collection of memorabilia has been lost to the family. One day a grandchild or great-grandchild may love to have had a glimpse into their ancestor’s past. 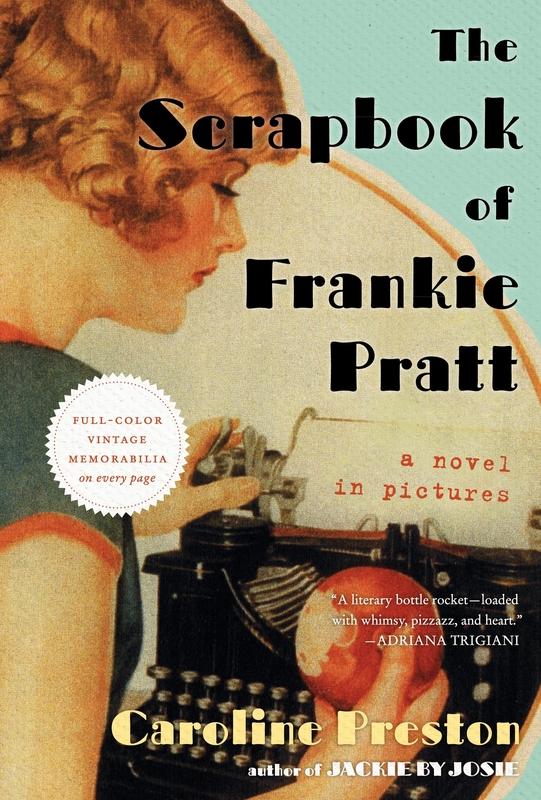 As an avid scrapbooker, I was excited to come across Caroline Preston’s novel, The Scrapbook of Frankie Pratt. It is a novel told through pictures in the form of a vintage scrapbook. It tells the story of Frankie Pratt, from her high school graduation in 1920, through her journey from Greenwich Village to New York and Paris in pursuit of her dream to become a writer. The author, Caroline Preston, has collected antique scrapbooks since she was in high school. She has drawn from her vast collection of vintage ephemera to describe Frankie’s journey through the Bohemian culture of the 1920’s using vintage postcards, fashion cut-outs, tickets, newspaper cuttings, fabric swatches and much more. The book provides a delightful glimpse into life as it was for a young woman in the 1920’s, and contains so much memorabilia on each page that you just want to keep going back to it time and again. This entry was posted in Favourite Books, My Blog and tagged The Scrapbook of Frankie Pratt, vintage scrapbooks. Bookmark the permalink.